What is it Rajni Cant? 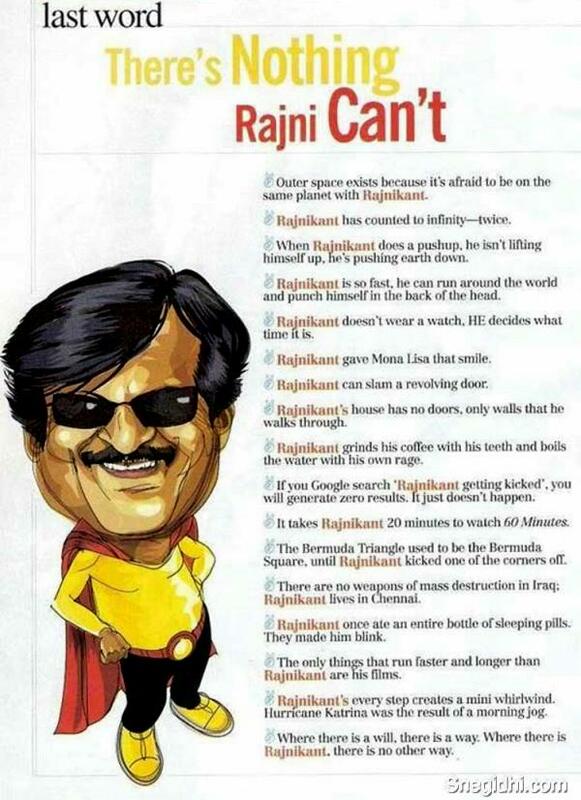 So what is it that Rajni ‘Can’t’ ? Raghudon has always wondered why people were crazy about ‘Superstar’ , ‘Thalaiva’ Rajnikanth. As a child , whenever I visited Chennai I used to be welcomed with posters of Rajnikanth at the Chennai Central station , and other places as well ( autos, bus stands , paan-shops and so on!). Prior to the release of Rajni’s much awaited ‘Enthiran’ I received showers of ‘Rajni can-Rajni can’t’ mumbo-jumbo be it through text messages on my mobile or through social networking websites like Facebook and Twitter ( I bet everyone would have!) 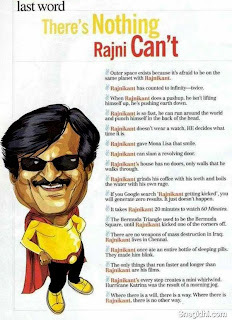 To name a few-’Outer space exists because it’s afraid to be on the same planet as Rajnikanth’ ; ‘Rajnikanth’s house has no doors, only walls that he walks through’ ; ‘Rajnikanth grinds the coffee with his teeth and boils the water with his own rage’ and many more . Initially , these one-liners were entertaining and humorous, however, after a point of time they became repetitive and stale. The question here is- What is the reason behind this ‘Rajni rage’ ? It is obvious that there can be no smoke without fire. Similarly there must be some reason behind Rajnikanth’s immense popularity and huge fan-following. As one enters a cinema hall screening a Rajni movie everything from outside the filmy world is forgotten. One is swept through the other side of the world, a world where Rajnikanth is no less than a ‘demi-god’. This is a world where his fans are devout soldiers, who can but humbly kneel in the deepest respect and admiration for this superstar. Every single dialogue, action stunt and dance number that the towering figure called Rajnikanth makes is welcomed with whistles , boisterous cheers and hootings. Anyone who is an ‘outsider’ to the Rajni world would either be astonished at the site, laugh their guts out, or get annoyed with the fans. Soon the hue and cry surrounding the movie settles, and the most obvious question pops up again – Why is Rajnikanth so popular? What does this superstar have in him that makes him what he is? Why is it that when he throws a cigarette in the air, lights it with a revolver and catches it , the crowds go absolutely crazy? However, two reasons that can be traced for this craze are his unique style and his down-to-earth personality. Most of Rajnikanth’s popularity has risen out of his unique mannerisms, stunts and style of dialogue delivery. Rajni is perhaps the only superstar in cinema who can get away with gravity defying stunts such as causing a mini-tornado with one foot and killing a goon miles away by throwing a pistol in the air. Such stunts have been trademarked as ‘Rajnikanth stunt’ by the general public. Rajnikanth, born Sivaji Rao Gaekwad, had worked as a bus conductor. That could be another reason why his fans can connect with him. He was one of them, and still is, in spite of all the fame and money.Almost all show-world success stories in India appear the same. What sets individuals apart is the approach and the attitude once they reach the top. No one can resist a rags-to-riches story. It is every common man’s dream. But Rajinikanth’s story is irresistible. He continues to be an enigma to both his fans and contemporaries. He is simple Shivaji Rao Gaekwad who, by way of luck and hard work became a superstar, and continues to remain on top notwithstanding the vagaries of time. He is not a superstar because of his acting skills, but because he represents the common man , his aspirations , and above all simplicity. Being an ‘outsider’ to the Rajni world I do find his stunts funny , impossible and at times silly, but I cannot deny the fact that Rajni’s simplicity and humility are the reasons behind his success , after all there is always beauty in simplicity, which is probably why there is nothing that Rajni ‘Can’t'! To establish a central government anti-corruption institution called Lokpal, supported by Lokayukta at the state level. As in the case of the Supreme Court and Cabinet Secretariat, the Lokpal will be supervised by the Cabinet Secretary and the Election Commission. As a result, it will be completely independent of the government and free from ministerial influence in its investigations. Members will be appointed by judges, Indian Administrative Service officers with a clean record, private citizens and constitutional authorities through a transparent and participatory process. A selection committee will invite short-listed candidates for interviews, video recordings of which will thereafter be made public. Every month on its website, the Lokayukta will publish a list of cases dealt with, brief details of each, their outcome and any action taken or proposed. It will also publish lists of all cases received by the Lokayukta during the previous month, cases dealt with and those which are pending. Investigations of each case must be completed in one year. Any resulting trials should be concluded in the following year, giving a total maximum process time of two years. Losses to the government by a corrupt individual will be recovered at the time of conviction. Government office-work required by a citizen that is not completed within a prescribed time period will result in Lokpal imposing financial penalties on those responsible, which will then be given as compensation to the complainant. Complaints against any officer of Lokpal will be investigated and completed within month and, if found to be substantive, will result in the officer being dismissed within two months. The existing anti-corruption agencies [CVC], departmental vigilance and the anti-corruption branch of the [CBI] will be merged into Lokpal which will have complete power authority to independently investigate and prosecute any officer, judge or politician. Whistle-blowers who alert the agency to potential corruption cases will also be provided with protection by it. Note in the above the time boundness of the process as well as 1 month deadline to deal with corrupt lopayukt people. The financial implications on govt people may be sounding funny at first but then in the long run it will ease out. I believe it may be a decade before the full impact is seenbut it is definitely better than the incumbent systems where a laalo Yadav can steal fodder from cows and still be one of indias most respected politicians! The process is participative. So tomorrow you also can be a part of the system. Lokpal will have powers to initiate suo motu action or receive complaints of corruption from the general public. Lokpal will have no power to initiate suo motu action or receive complaints of corruption from the general public. It can only probe complaints forwarded by the Speaker of the Lok Sabha or the Chairman of the Rajya Sabha. Lokpal will have the power to initiate prosecution of anyone found guilty. Lokpal will only be an Advisory Body with a role limited to forwarding reports to a "Competent Authority". Lokpal will have no police powers and no ability to register an FIR or proceed with criminal investigations. Lokpal and the anti corruption wing of the CBI will be one independent body. The CBI and Lokpal will be unconnected. Punishments will be a minimum of 10 years and a maximum of up to life imprisonment. Punishment for corruption will be a minimum of 6 months and a maximum of up to 7 years. Hence you see from the above that the government wants only tpo create another committee which they want to please the people by saying yes we didit.... also thats the reason that they are creating an eyewash with the opposition opposing it (surprising) but then no politician wants his pocketto be checked! PM can be investigated by Lokpal after she/he vacates office. Judiciary is exempt and will be covered by a separate "judicial accountability bill". Can be investigated, but their conduct within Parliament, such as voting, cannot be investigated. All public servants would be included. Only senior officers (Group A) will be covered. The Anti-corruption wing of the CBI will be merged into the Lokpal. The Anti-corruption wing of the CBI cannot be merged into the Lokpal. Any person can bring a complaint to the Supreme Court, who can then recommend removal of any member to the President. Any "aggrieved party" can raise a complaint to the President, who will refer the matter to the CJI. Complaints against Lokpal staff will be handled by independent boards set-up in each state, composed of retired bureaucrats, judges, and civil society members. Lokpal will conduct inquiries into its own behaviour. Lokayukta and other local/state anti-corruption agency would remain in place. All state anti-corruption agencies would be closed and responsibilities taken over by centralised Lokpal. Whistleblowers are protected by Lokpal. No protection granted to whistleblowers by Lokpal Mahima. Lokpal can either directly impose penalties, or refer the matter to the courts. Penalties can include removal from office, imprisonment, and recovery of assets from those who benefited from the corruption. Lokpal can only refer matters to the courts, not take any direct punitive actions. Penalties remain equivalent to those in current law. Lokpal can obtain wiretaps ( to make a connection to a telegraph or telephone wire in order to obtain information secretly), issue rogatory letters, and recruit investigating officers. Cannot issue contempt orders. Lokpal can issue contempt orders, and has the ability to punish those in contempt. No authority to obtain wiretaps, issue rogatory letters, or recruit investigating officers. Lokpal can issue fines for frivolous complaints (including frivolous complaints against Lokpal itself), with a maximum penalty of Rs 100,000. Court system will handle matters of frivolous complaints. Courts can give 2–5 years imprisonment and fines of Rs 25,000 to 200,000. NGOs not within the scope due to their role in exposing corruption. NGOs are within the scope and can be investigated. Roti is adultrated. Grains and vegetables are wasted.... if they conserve what is produced, we can feed the world! Makaan – 30% of the cost of the house is black... to generate this the money is siphoned from the exchequered... to generate that the corruption is necessary!